This historical costume project came about as an attempt to salvage another historical costume project. Let’s begin with the dress that inspired the jacket. Warning, this post is long so if you’d like to skip to the discussion on the jacket, continue down until you see more jacket photos. I sewed this white Regency gown years ago but due to a massive fail on my part, it lingered in the Drawer of Shame ever since. See, I bought this thin, semi-sheer striped cotton destined for a sheer dress gown. 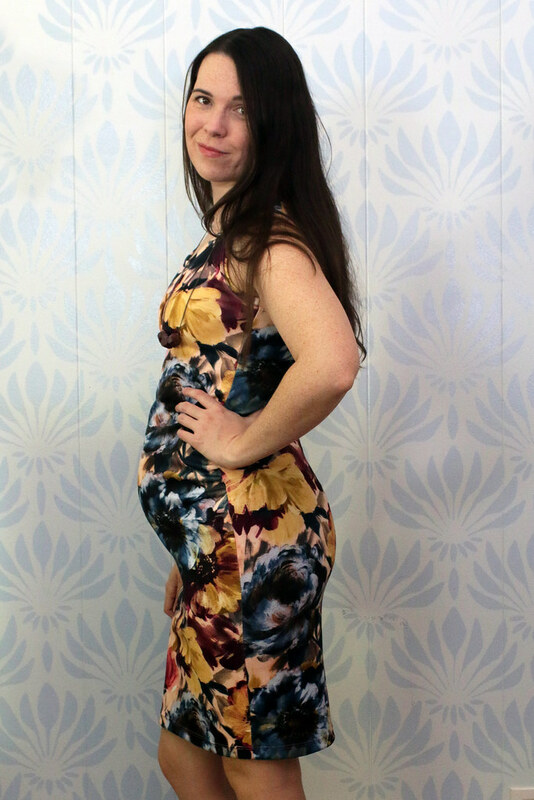 I’d already made Laughing Moon #126 and loved the fit and imagined I could use this fabric with that pattern. However, that pattern is an apron front dress and were I to make it with a sheer fabric, the entire interior bodice structure would be exposed. Hmm, how to work around this…? Rather than lining the bodice (which would ruin the sheer effect I was going for) I chose to convert the entire bodice to a back-closing design with drawstrings. To do that I needed to widen the back pieces so they could be gathered up by the drawstrings at the waist and neckline. But I didn’t cut the back pieces extra wide. Because I forgot. Or something. I don’t remember. Instead, I cut the back like normal and didn’t have enough fabric left to cut new pieces. Ugh. Without the extra width, the drawstrings couldn’t do their job leaving MASSIVE gaping in the center back. But this solution still resulted in gaping. Because of course there would be gaping. The original dress is designed with a close-fitting back and if you split that back in half, the fabric will strain at that point. It looked awful and unwearable and showed all the undergarments in the back. Enter 2018 and the new solution: SPENCER! Why didn’t I think of this before!?? Spencers were a style of cropped jacket unique to the Regency period of about the 1790s-1820s. They were often worn over gowns when it was too warm for a full coat. Luckily, I had plenty of this black cotton velveteen leftover from other projects and I read somewhere that velveteen was used for Spencers in the early 1800s. I used View C of Laughing Moon #129. I liked the “tails” in the back which would cover more of the back bodice of the dress and the high collar gave the jacket a military feel. Laughing Moon says this design is good for 1798-1809 which pairs well with my jockey-style bonnet from around the same period. I ordered a black taffeta from Silk Baron for the lining. I liked the idea of the shiny silk contrasting with the velveteen, but the black on black still makes it easy to match the jacket with dresses and accessories. I find that Laughing Moon patterns fit me well right out of the envelope and this was no exception. The only problem is that the armholes are a tad snug but I bet that’s because the velveteen seam allowance is so bulky where it is gathered. 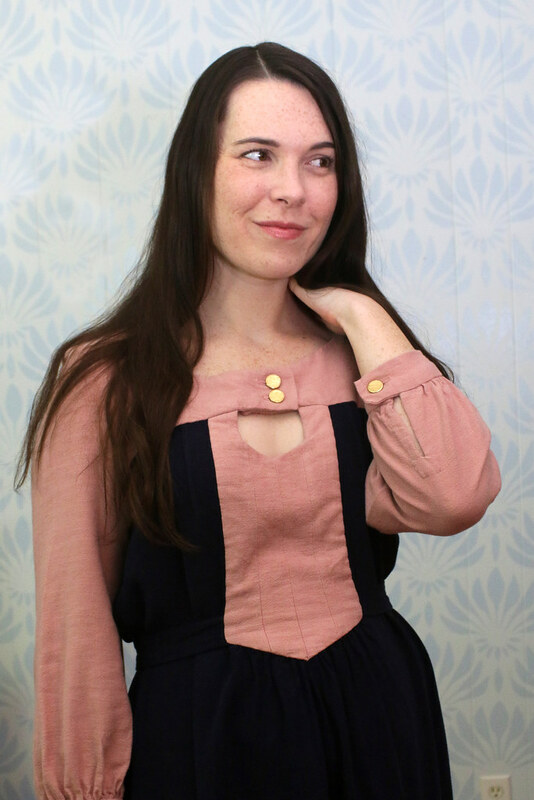 The only change I made was to shortened the sleeves by about 1/2″. They’re meant to be quite long but even so, they were super long. The sleeves bell out at the wrist and I like that I can roll up the cuffs if I want to show off more silk. The button came from a swap. 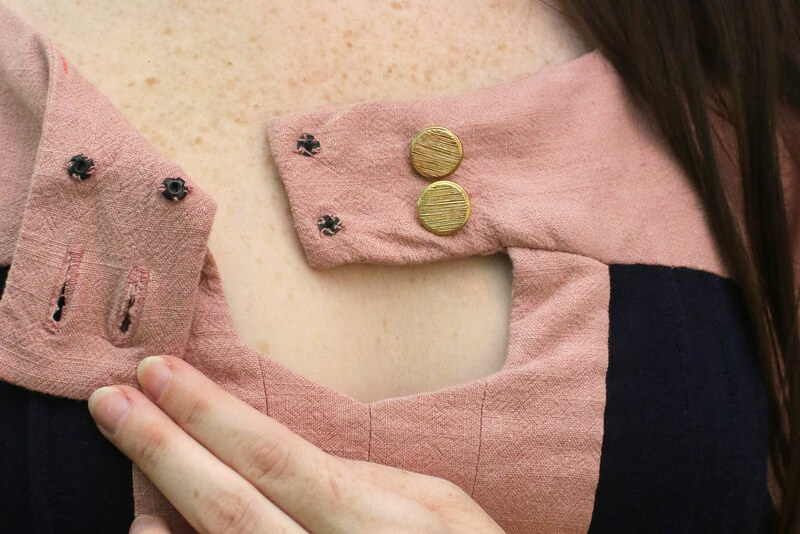 I originally attached two buttons for symmetry but the “faux” button was droopy and looked unsymmetrical despite the buttons being stitched in the same place. I took the extra button off. Sewing this pattern proved more challenging than I expected. I knew I’d have to do plenty of hand sewing here and there but I struggled with the points near the collar and with the pleats in back. I had to do some extra hand sewing and clipping to make sure everything layed correctly. Sewing the velveteen proved challenging as well. While not as slippery as silk velvet, the pile on this fabric makes it difficult to sew without the layers shifting. 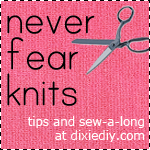 I used a walking foot and a long stitch length to accommodate this finicky fabric. For this outfit, I’m wearing my Regency undergarments, the dress, Spencer, my silk bonnet, a coral bead necklace and an extra long pashmina shawl (made by stitching two long shawls together at one end). In the end, this jacket turned out fantastic! The cut is perfect for this era. I love the contrast between the sleek silk and the heavy velveteen. The whole outfit looks straight out of a French fashion magazine. 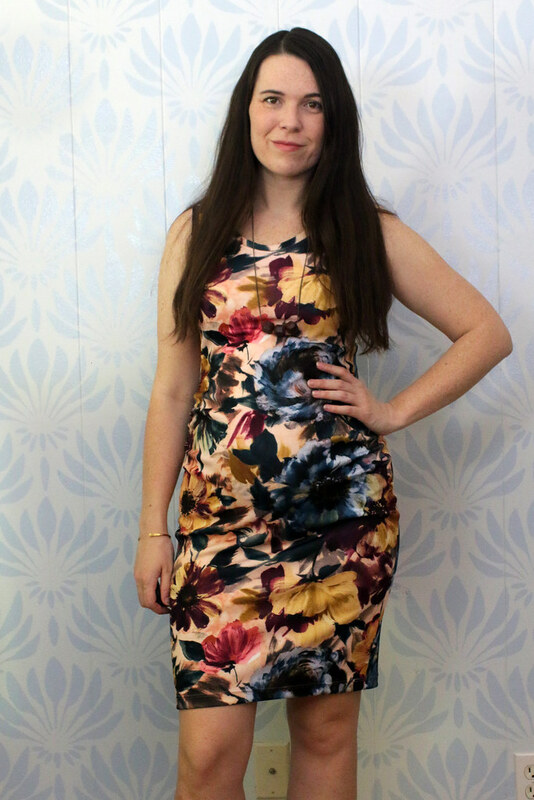 Back again with more #SummerSewing! Almost to the end. After this I just have one more garment to share. 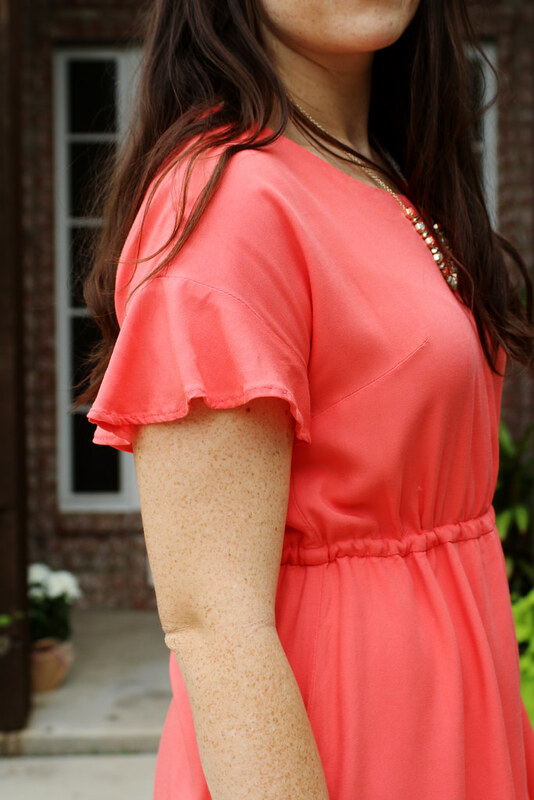 This is the Papercut Patterns Adrift Dress in a coral rayon twill. I used leftover white cotton cording and a couple silver eyelets for the drawstring and casing. This is the 7th pattern from Papercut that I’ve tried. They tend to fit me fairly well and overall I like their stying. 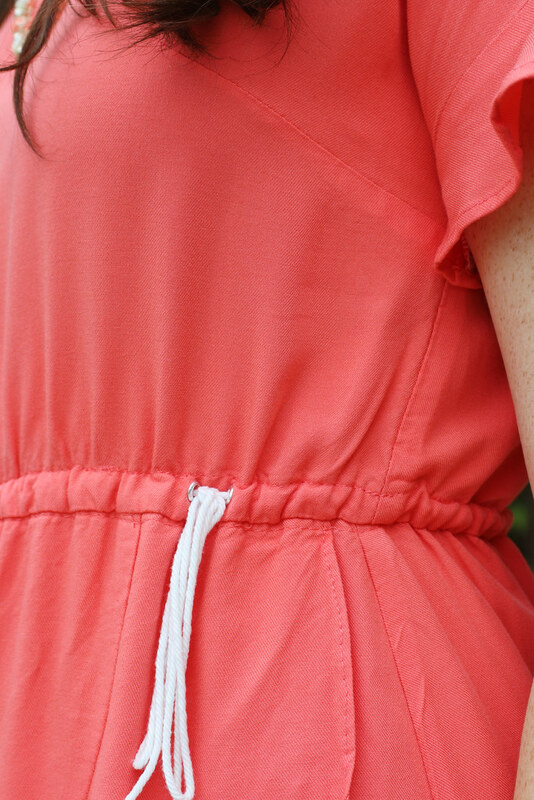 Fun fact, in my original #SummerSewing moodboard, I had the Sway Dress by Papercut in a coral twill. And I even made it! But I used a stretch woven sateen from Joann and that fabric was terrible. You could see the lines of the neck and arm facings through the fabric. 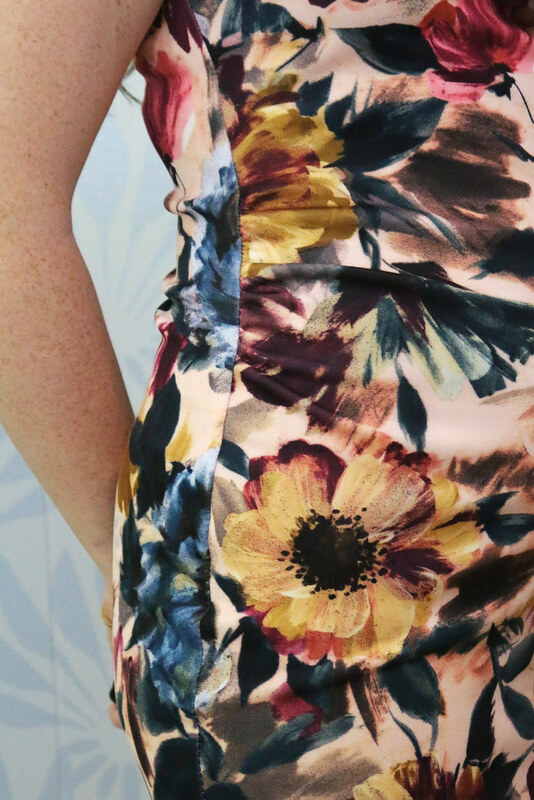 You could also see the lines of everything else that was under the fabric… It was unwearable. 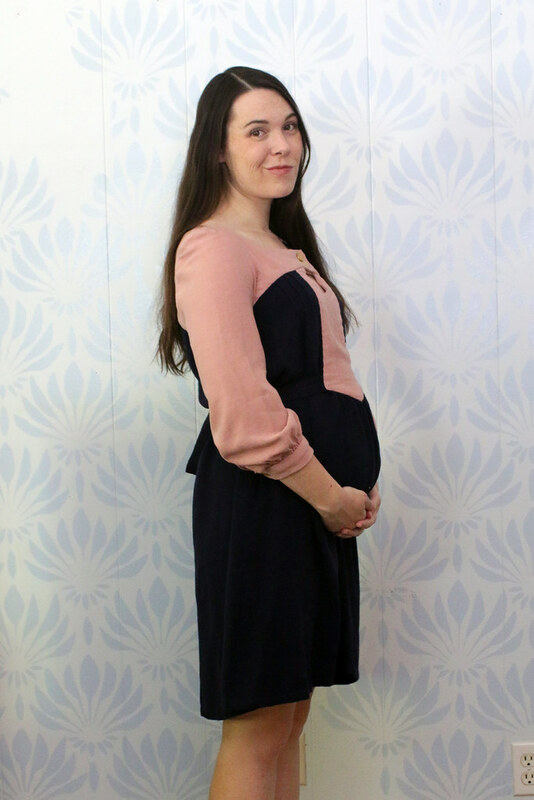 I scrapped that dress and made the Adrift instead, with rayon rather than cotton, and I’m so glad I did! I love this dress! 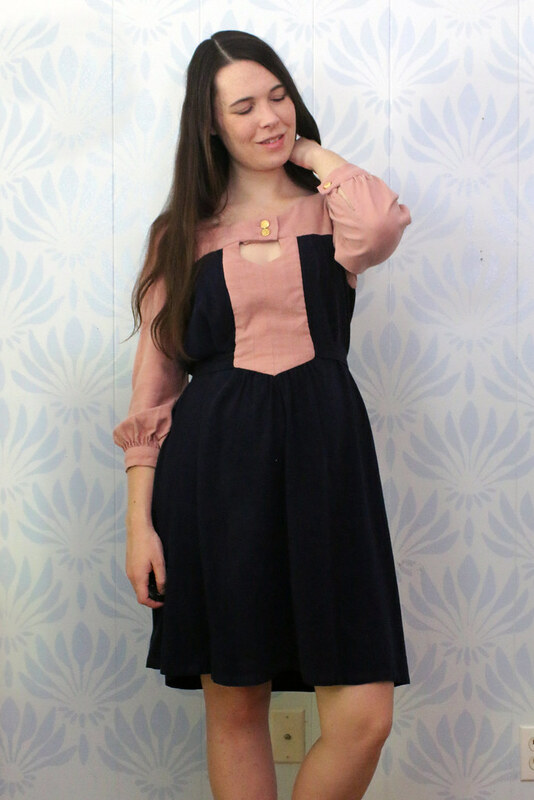 The rayon is perfect for the flowy ruffles on the sleeves and skirt. 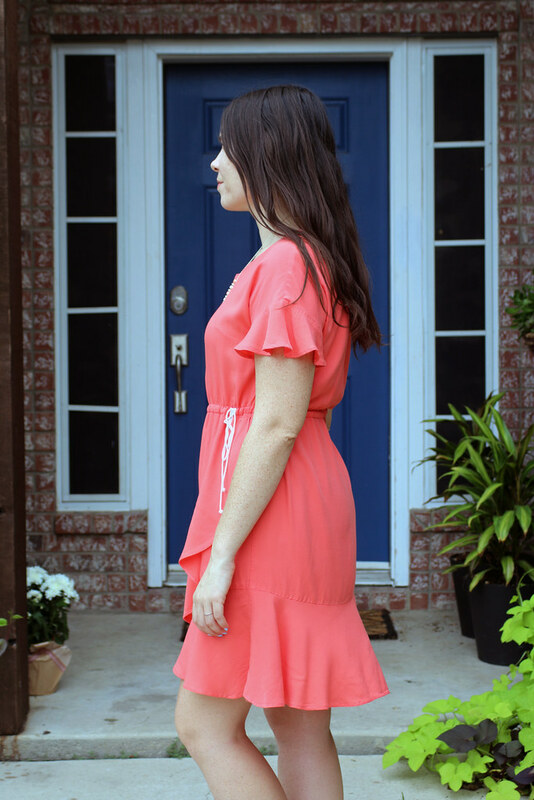 I like the adjustable drawstring at the waist (it’s a faux wrap skirt, the drawstring doesn’t hold the skirt together, it just allows for better fit) and coral is my favorite color. Only problems with this dress: 1) darts are a wee bit too high. Not a big deal. 2) Rayon. 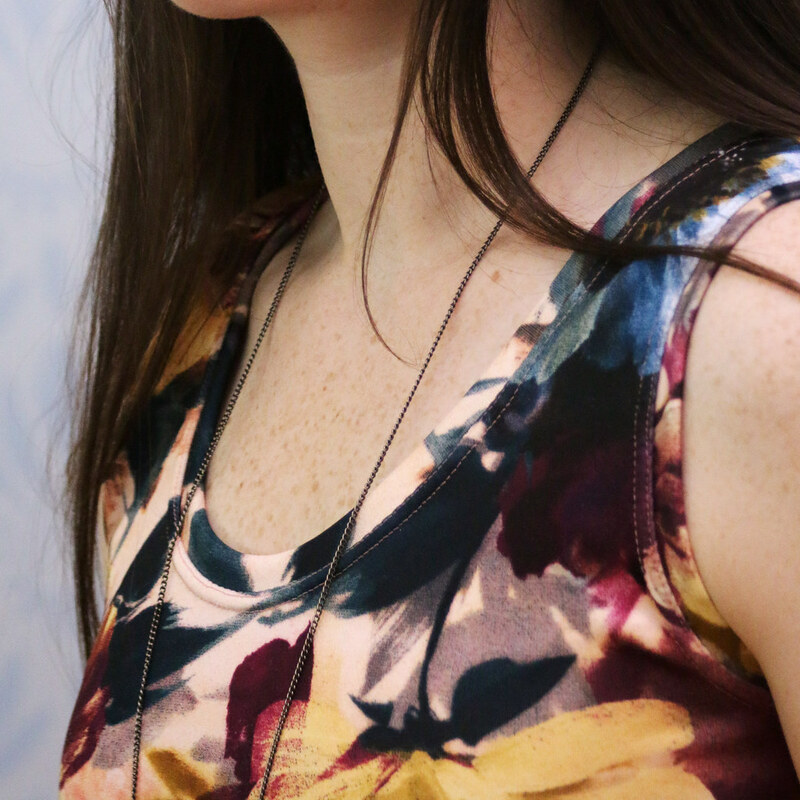 Rayon gets super wrinkly with wear, and it’s especially noticeable in a solid color. Luckily the wrinkles soften with heat and since it’s always hot in Texas I hope the wrinkles won’t be terrible. Not that I mind too much. 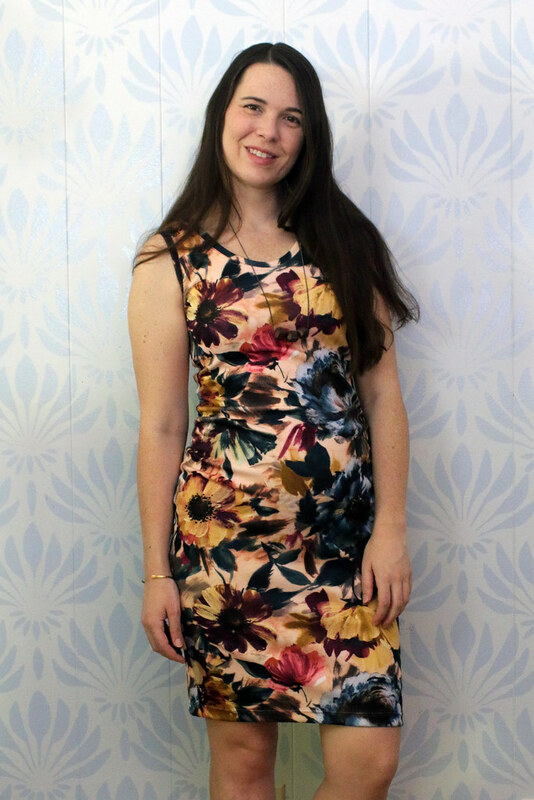 This dress is so cute, even with wrinkles!